OIT lab services Get the HP Directions for this one. 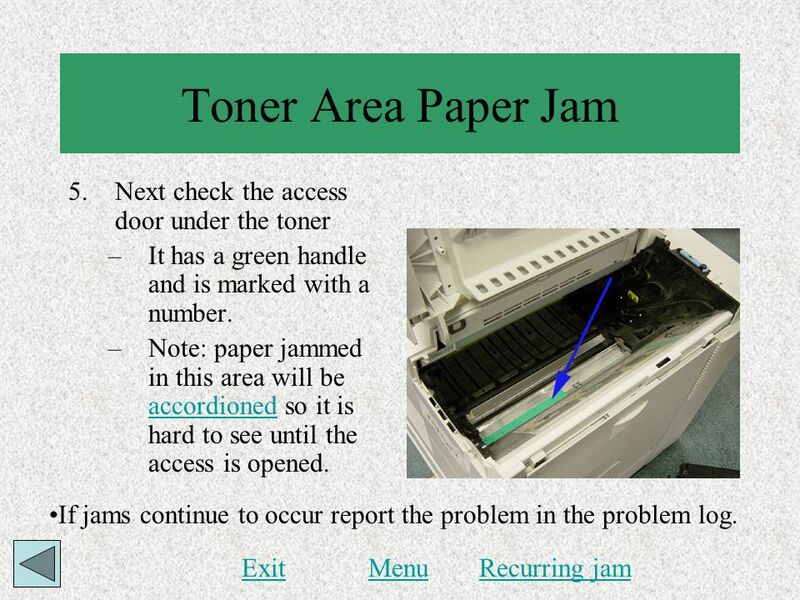 Check all access doors Many times there is a second access door inside the printer If it has a green handle it opens Check for small pieces of paper inside the printer. 4 Right Side Door Open the right door located below Tray 1. 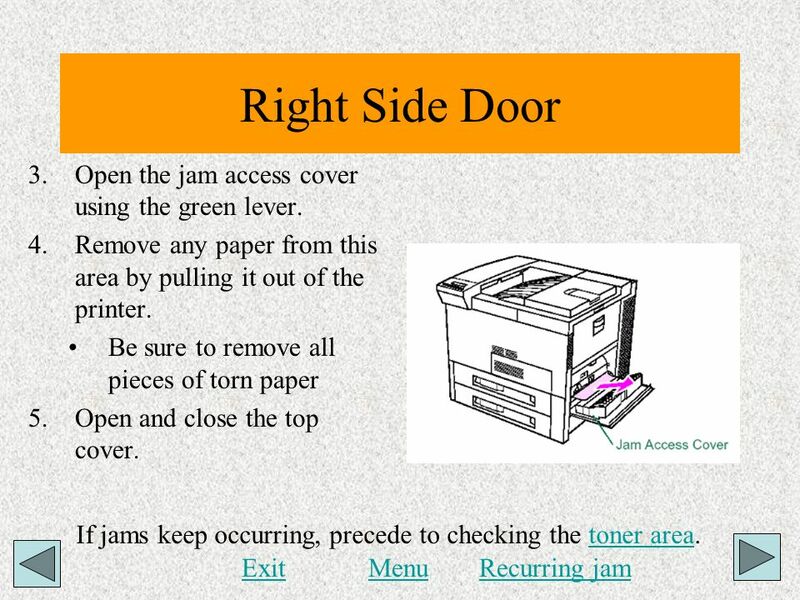 5 Right Side Door Open the jam access cover using the green lever. 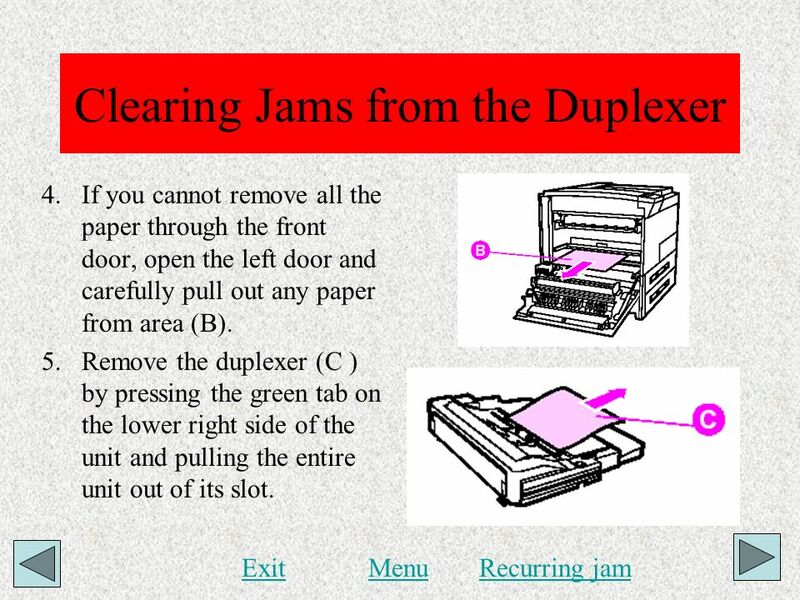 6 Paper Tray Jams Open the tray and look for misfed pieces of paper. 7 Clearing Trays 2 and 3 Open the tray. 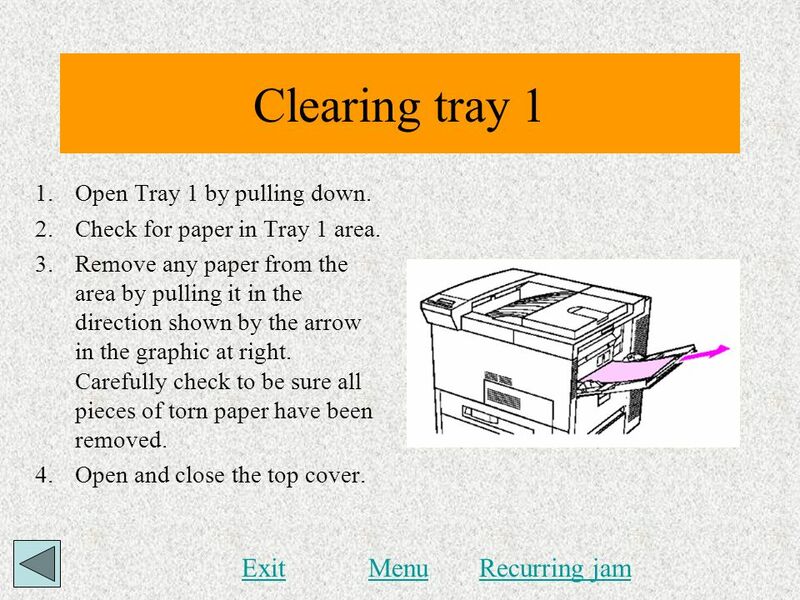 8 Clearing tray 1 Exit Menu Recurring jam Open Tray 1 by pulling down. 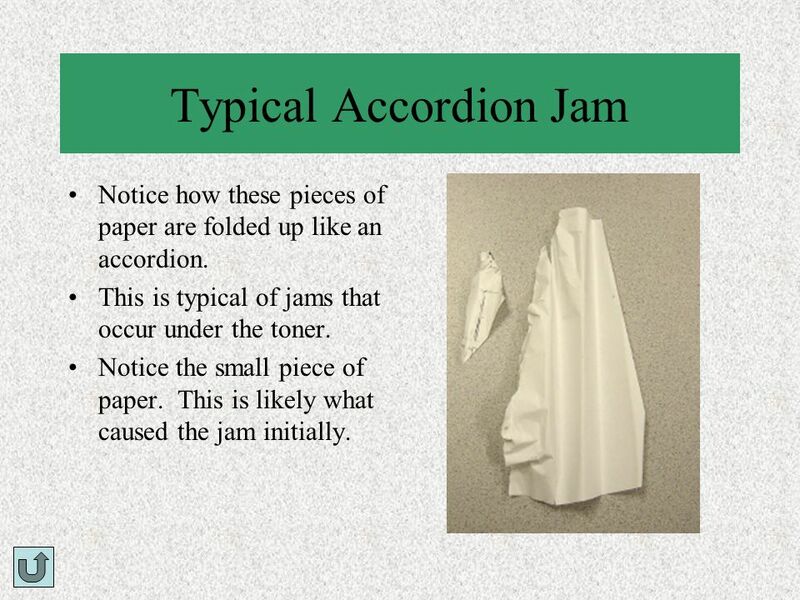 15 Typical Accordion Jam Notice how these pieces of paper are folded up like an accordion. 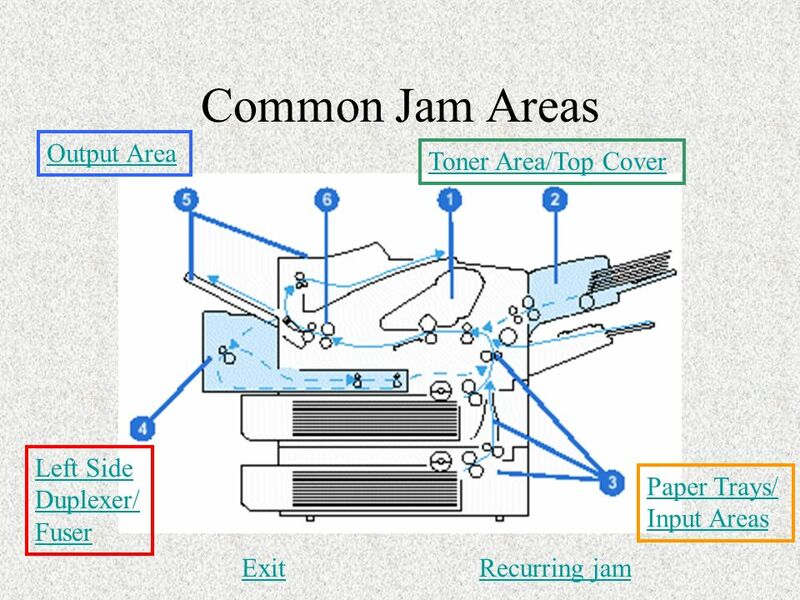 This is typical of jams that occur under the toner. Notice the small piece of paper. This is likely what caused the jam initially. 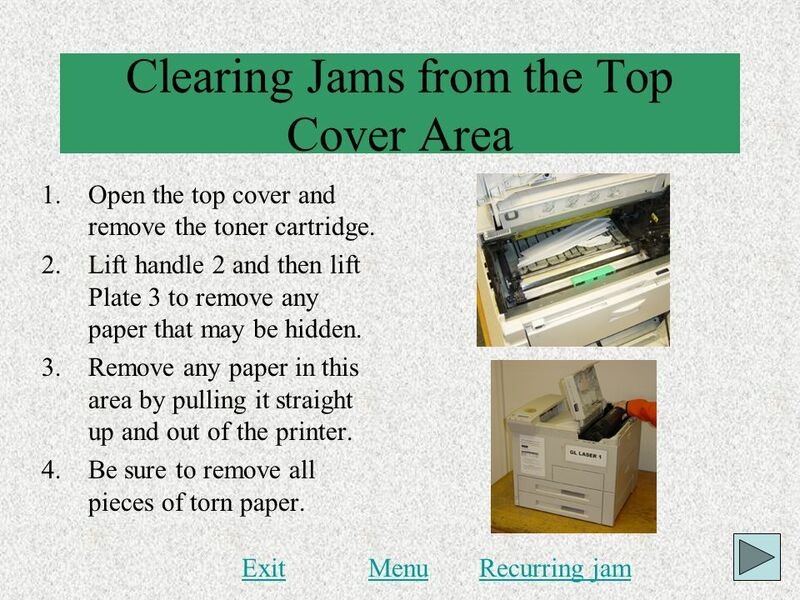 Check for small pieces of paper stuck in the printer Common places to look Under the toner Fuser Various access doors Small pieces of paper can be left in the printer if a page is torn when pulling out a jam. 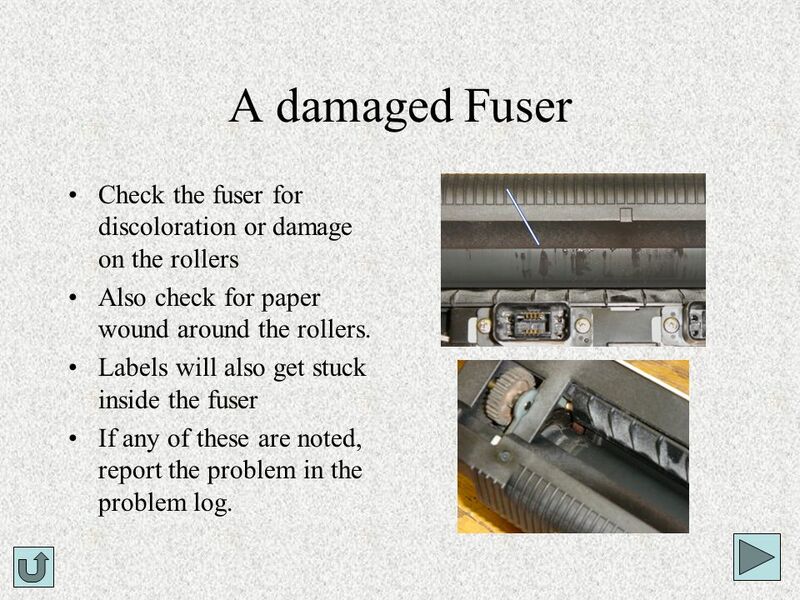 19 A damaged Fuser Check the fuser for discoloration or damage on the rollers Also check for paper wound around the rollers. Labels will also get stuck inside the fuser If any of these are noted, report the problem in the problem log. Notice the discoloration on the rollers This is an example of what happens when a transparency is run through the printer. It has melted on the rollers. Labels will do the same thing. 21 Worn rollers The rollers pull the paper out of the tray and start it on its initial trek through the printer. 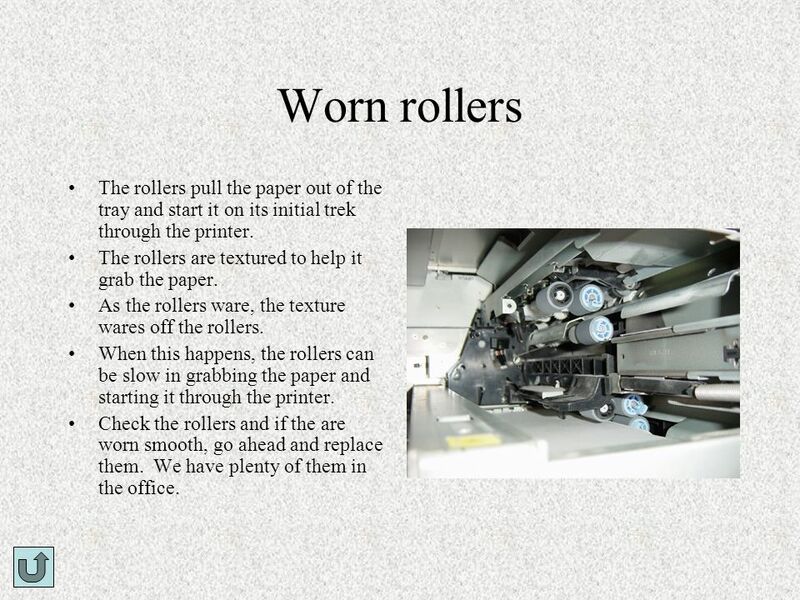 The rollers are textured to help it grab the paper. As the rollers ware, the texture wares off the rollers. 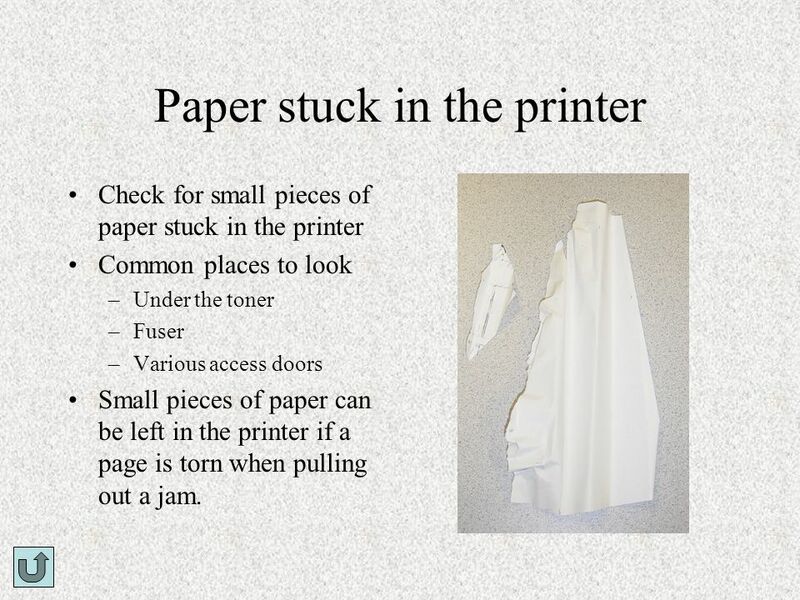 When this happens, the rollers can be slow in grabbing the paper and starting it through the printer. Check the rollers and if the are worn smooth, go ahead and replace them. We have plenty of them in the office. 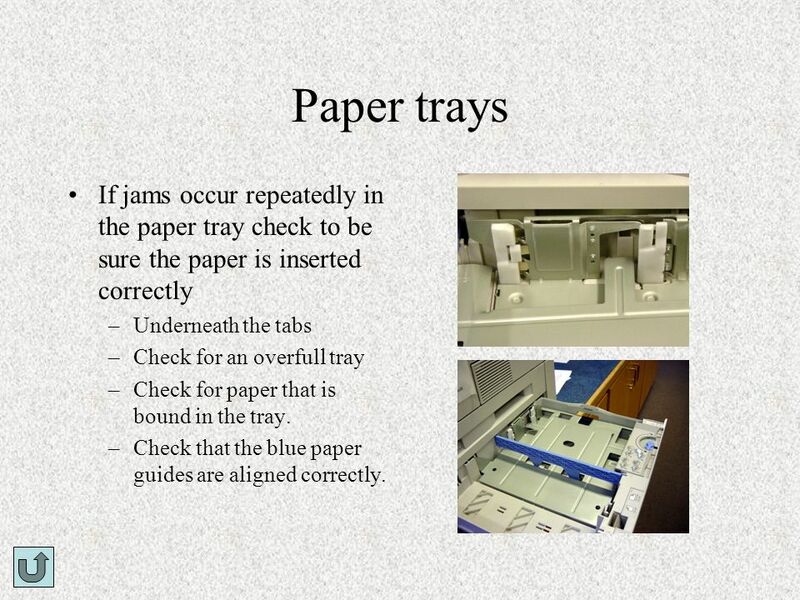 22 Paper trays If jams occur repeatedly in the paper tray check to be sure the paper is inserted correctly Underneath the tabs Check for an overfull tray Check for paper that is bound in the tray. Check that the blue paper guides are aligned correctly. 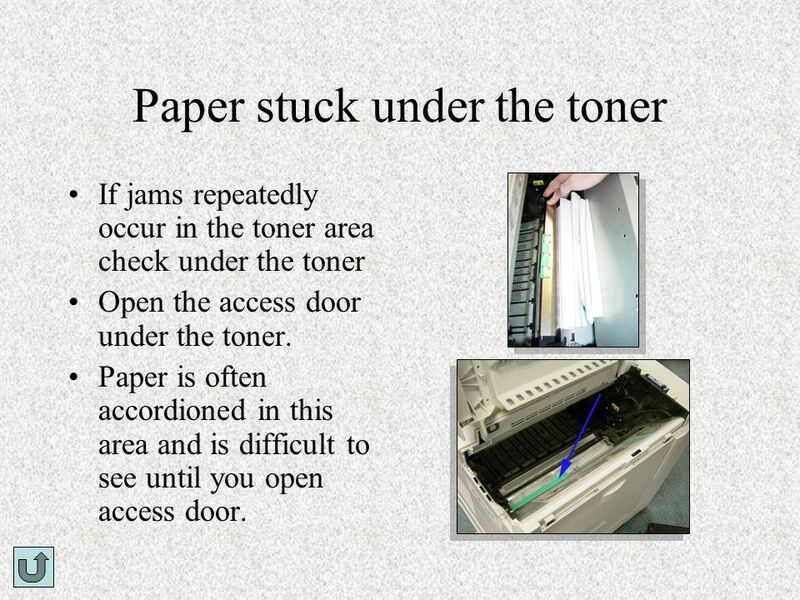 If jams repeatedly occur in the toner area check under the toner Open the access door under the toner. 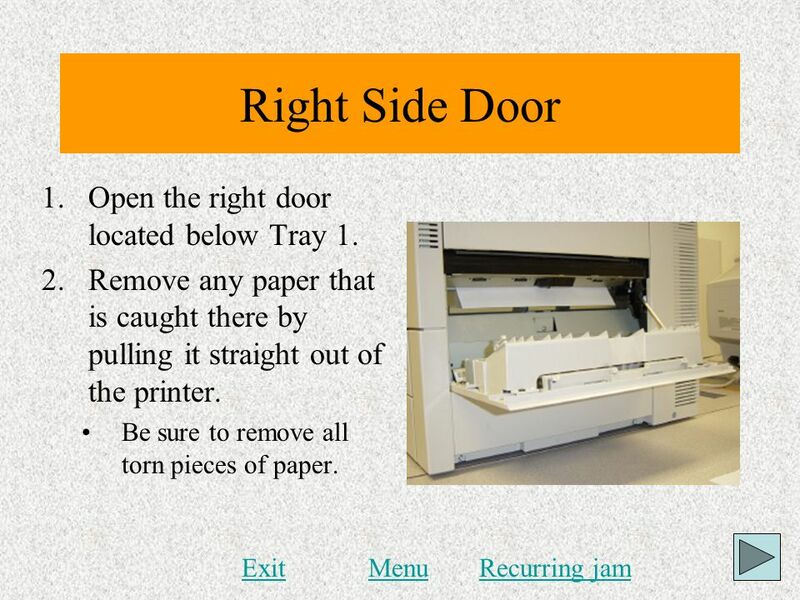 Paper is often accordioned in this area and is difficult to see until you open access door. 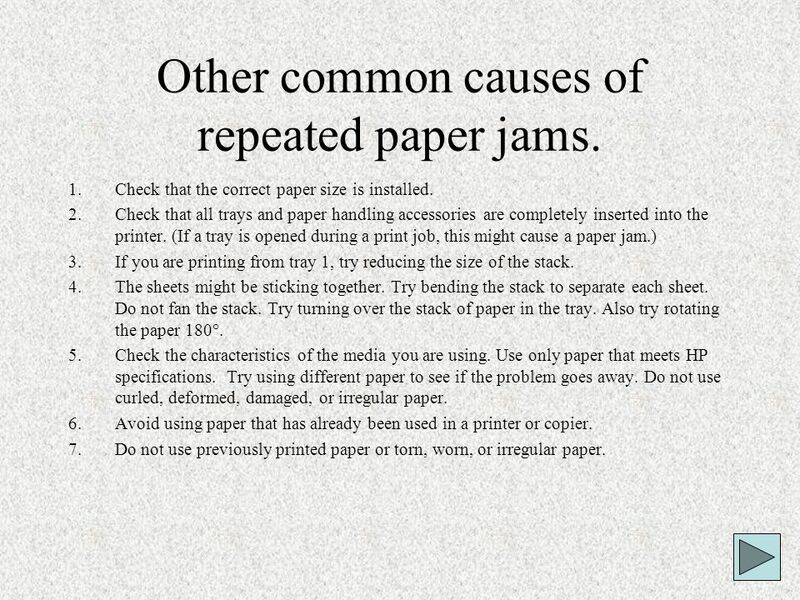 24 Other common causes of repeated paper jams. Check that the correct paper size is installed. 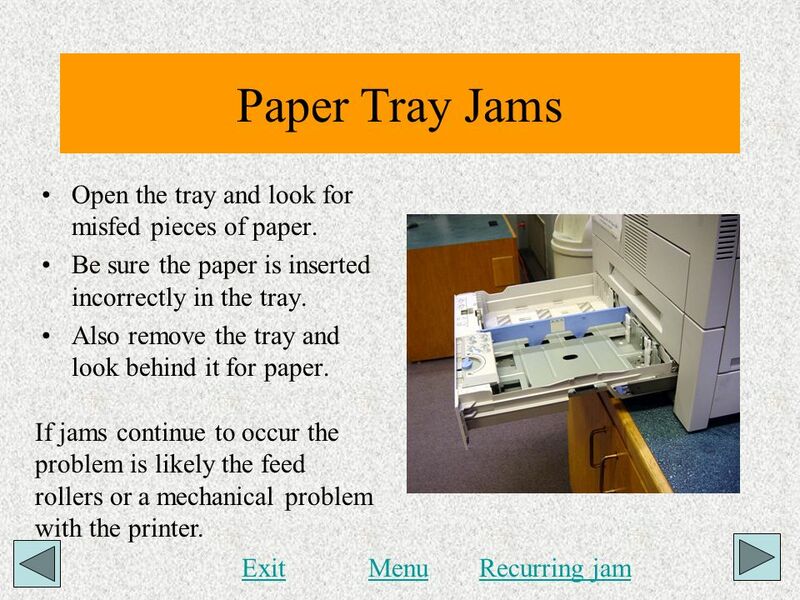 Check that all trays and paper handling accessories are completely inserted into the printer. 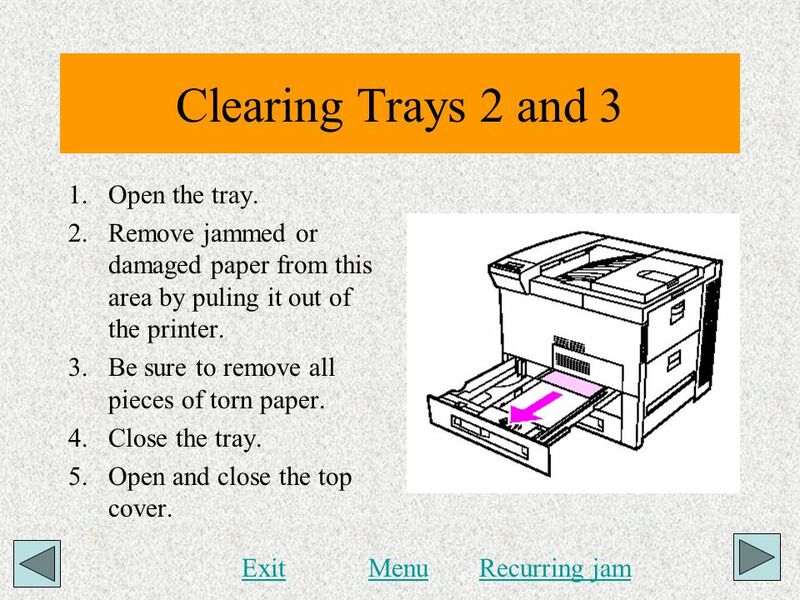 (If a tray is opened during a print job, this might cause a paper jam.) If you are printing from tray 1, try reducing the size of the stack. The sheets might be sticking together. Try bending the stack to separate each sheet. Do not fan the stack. Try turning over the stack of paper in the tray. Also try rotating the paper 180°. Check the characteristics of the media you are using. Use only paper that meets HP specifications. Try using different paper to see if the problem goes away. Do not use curled, deformed, damaged, or irregular paper. 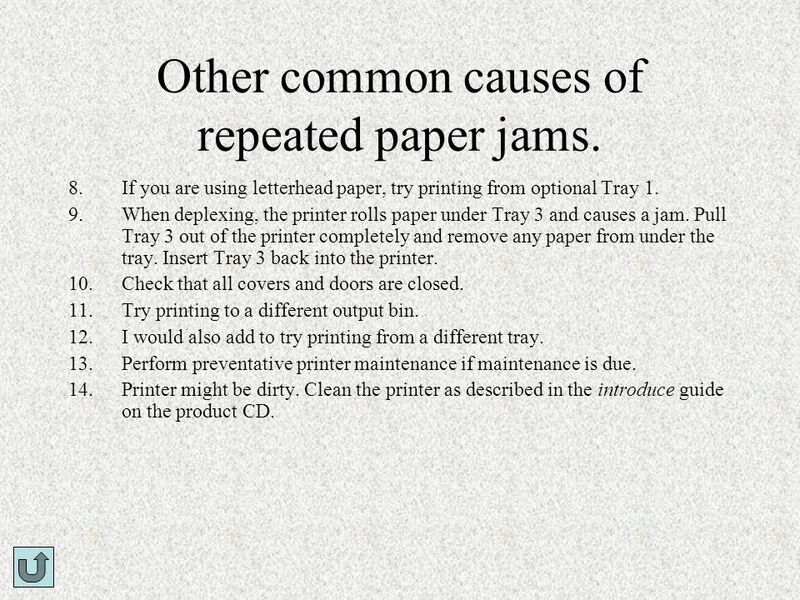 Avoid using paper that has already been used in a printer or copier. 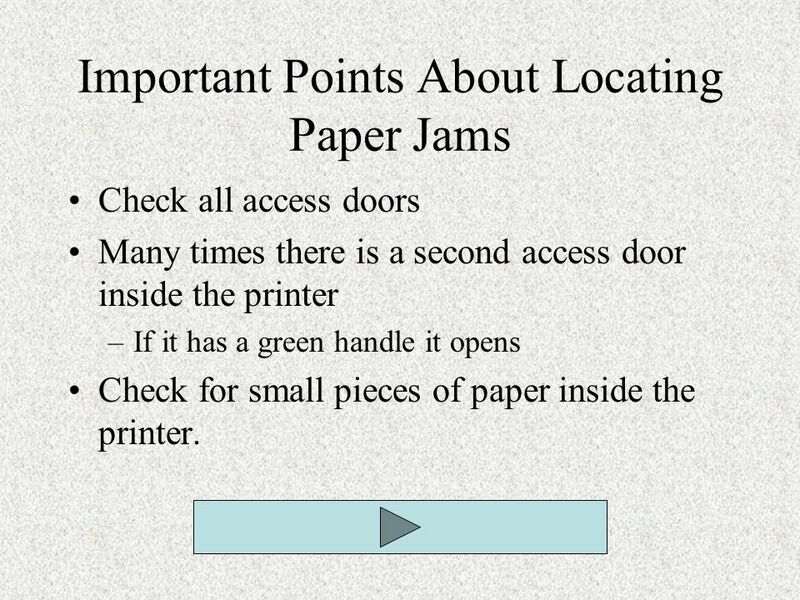 Do not use previously printed paper or torn, worn, or irregular paper. 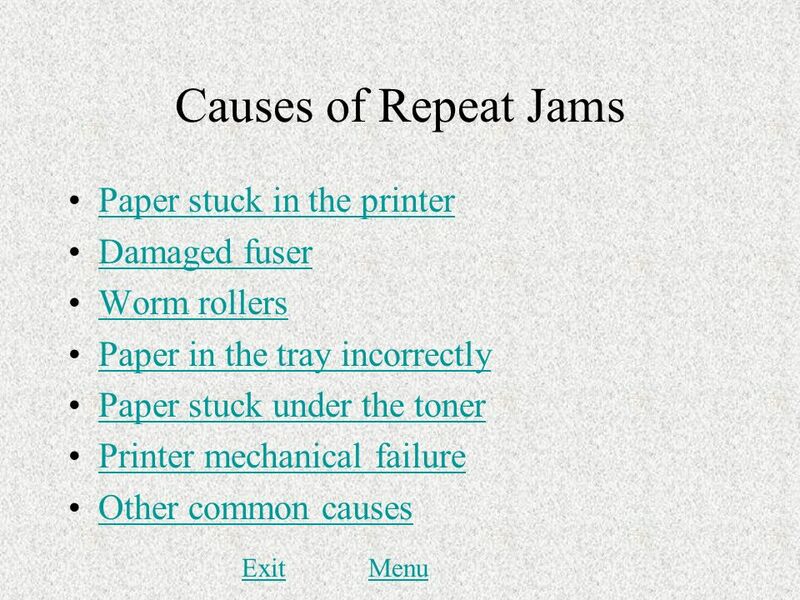 25 Other common causes of repeated paper jams. If you are using letterhead paper, try printing from optional Tray 1. 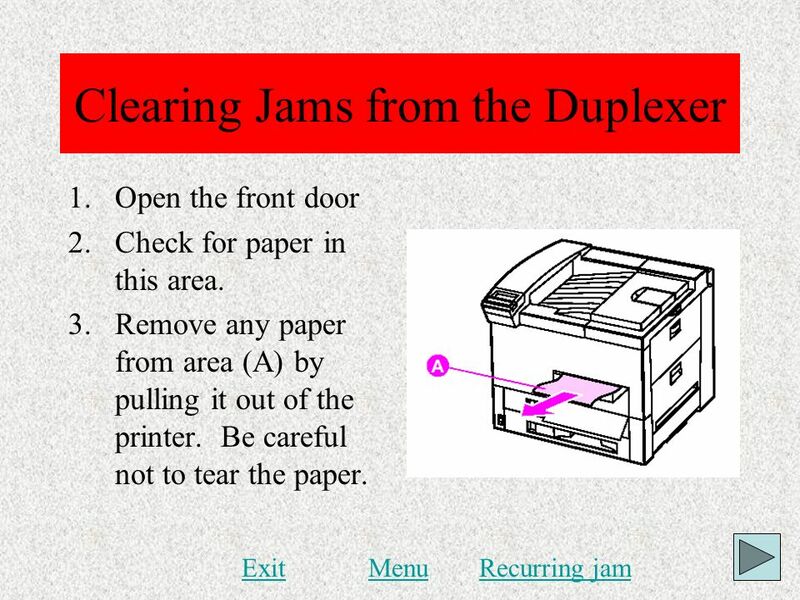 When deplexing, the printer rolls paper under Tray 3 and causes a jam. Pull Tray 3 out of the printer completely and remove any paper from under the tray. Insert Tray 3 back into the printer. Check that all covers and doors are closed. Try printing to a different output bin. I would also add to try printing from a different tray. Perform preventative printer maintenance if maintenance is due. Printer might be dirty. 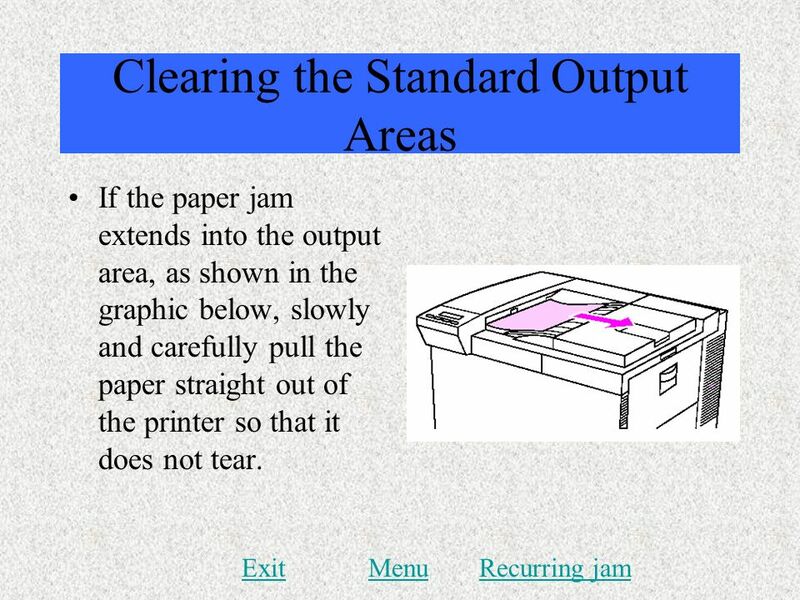 Clean the printer as described in the introduce guide on the product CD. 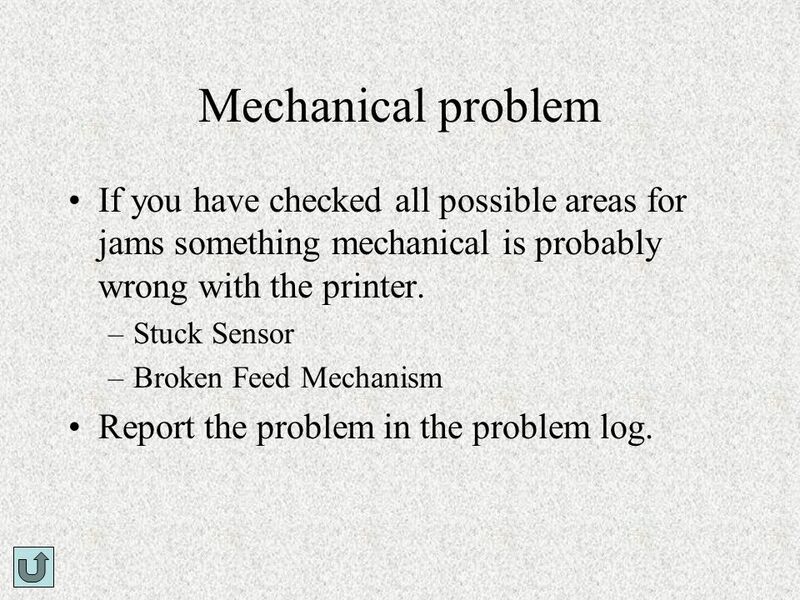 26 Mechanical problem If you have checked all possible areas for jams something mechanical is probably wrong with the printer. Stuck Sensor Broken Feed Mechanism Report the problem in the problem log. 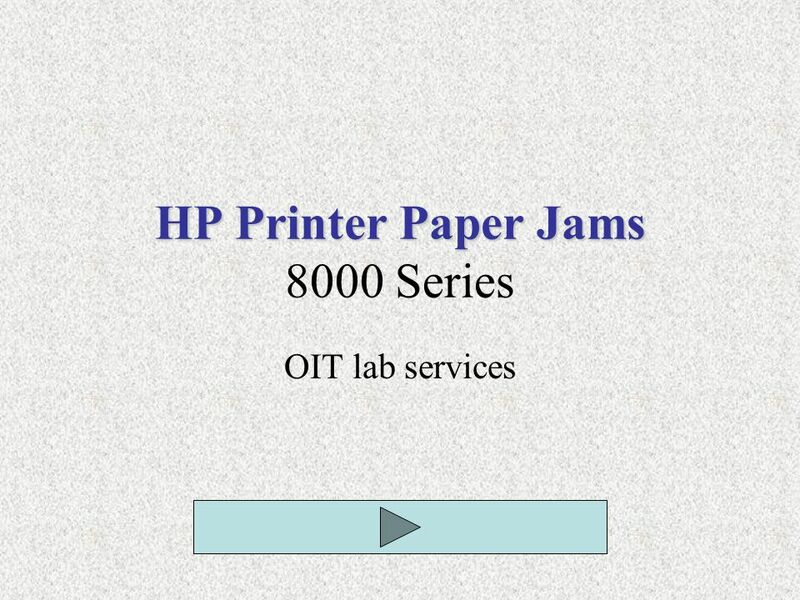 Download ppt "HP Printer Paper Jams 8000 Series"
Build Your Own Future RC2 Serviceability. Build Your Own Future Safety and Ground Rules Before servicing, always remove A/C power from the unit and disconnect. 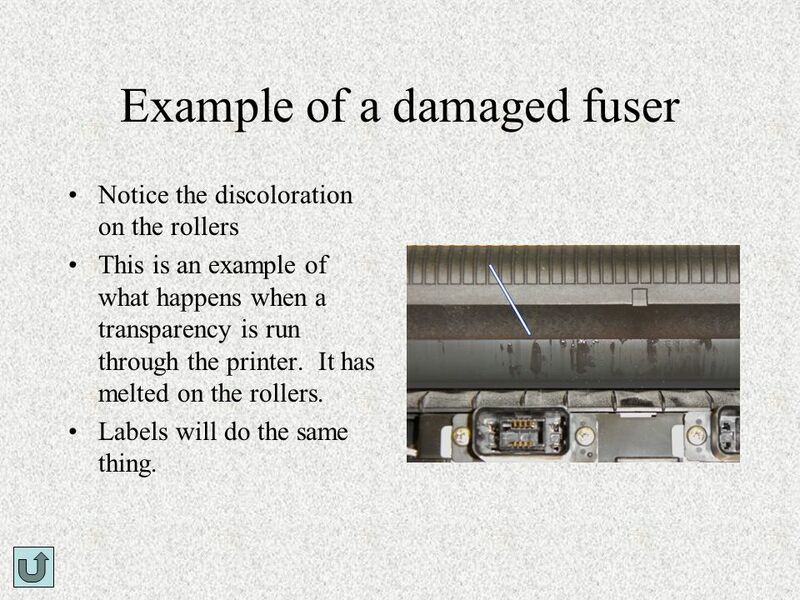 Printer Maintenance Proper printer maintenance can prevent many problems and lessen the effects of others. Routine printer maintenance procedures vary. 1 P720 PRINTER CLEANING PROCEDURES. 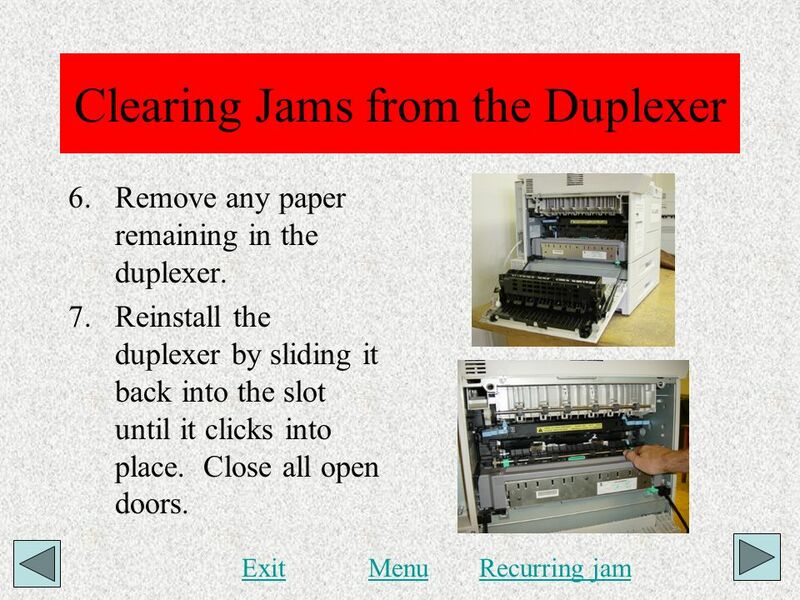 2 Printer Cleaning Instructions u For the P720 to Operate Properly It Is Important to Keep the Printer Clean and Free. 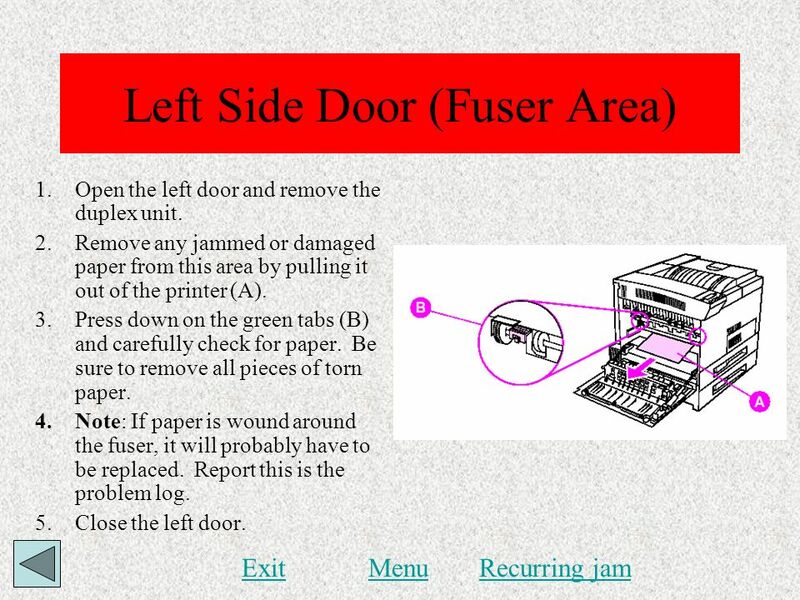 Printer Basics Easy fixes and other things to look for. By Abel Salazar. Printer and toner varience Printer List Toner Cartridge Installation Paper Jams Trouble Shooting Known Issues Information Pages. Replacing the Maintenance Kit HP Printers OIT lab services. 1 Stripe 400/600 Removing and Installing Printhead Printhead Resistance Calibration Toggle Position Adjustment. First Paper Feed Area Table Height Adjustment: There are two ways of adjusting the upper limit sensor. 1. You can put two sheets of paper on the paper. Start with a sheet of A4 paper size FOLD the paper on all lines then open up. 2 2. Optical Manufacturing Solutions 1 Probe Assembly. Packaging. First choose an illustration or use the image provided on the cover CD. When printing out your illustration it's a good idea to mark the way.